Social Media’s more relevant than it’s ever been and as such – small businesses have finally jumped on board and are beginning to take advantage of it. But even large businesses with crack marketers can make mistakes when it comes to social media. As a small business owner, there’s a lot to be learned from the mistakes as others and as such – it can help you gain a leg up on your competition. 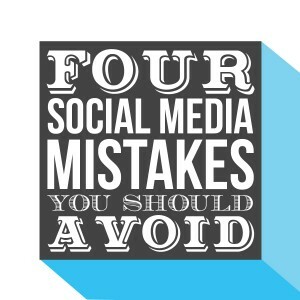 One of the most common mistakes that businesses make with social media – big and small – is that they try to hit too many mediums all at once. While all the major social media platforms have a profound use – that use might not mean anything to your business. That’s not even getting into what it takes to manage those accounts correctly. Properly administrating one account can be burdensome enough, never mind juggling four or five. Keep the platforms you use relevant and most importantly – keep them manageable. Coming down with a case of the Me-Me’s. While sure, your social media marketing IS about you, the content shouldn’t be. It should be about your customers – or more precisely – sharing information that’s relevant to them. It’s not to say there isn’t anything wrong with offering the occasional discount or advertising a bit. Everyone does and should keep doing so. Just don’t build all of your content around it. In order to get business on a social network, you should focus on finding what kind of content your customer base gets excited about and make the necessary investments in money and time to meet that demand. More often than not, people forget to include the ‘social’ component of ‘social media.’ It doesn’t mean that you talk AT people, it means presenting information and content in a way that engages your audience and begins a conversation. There is so much valuable information that can be had by asking the right questions and engaging in public forms like Facebook. You may even solve a problem you never knew you had. Keep up the dialogue and don’t be afraid to speak. Posting stuff isn’t a plan. Signing up for lots of accounts is not a plan. How you post, when you post, who you post it to and the desired reaction you hope to gain from it – that looks more like a plan. Without planning, you can lose out on a lot of hidden opportunities.